Earlier today, a new Wonder Woman poster debuted, featuring Gal Gadot as the title character kneeling on the beach, along with word that the actress will be presenting at Nickelodeon's Kids' Choice Awards with her co-star Chris Pine, where a new trailer will be released. If the new poster wasn't enough to tide you over before this trailer drops tomorrow, Warner Bros. has released a brief trailer preview, which features an intriguing new scene. This 15-second trailer preview debuted on Twitter earlier today, which features part of Diana of Themyscira's relentless training at the hands of General Antiope (Robin Wright), with Diana's mother Queen Hippolyta (Connie Nielsen) heard in voice over, telling Antiope she will train Diana harder than any other Amazonian before her, "until she is better than even you." The footage shows Diana training with Antiope, who tells her to never let her guard down, asking, "Do you expect the battle to be fair?" While Antiope keeps attacking Diana, she uses her bracelets to deflect Antiope's sword, which causes a blast of energy which sends Antiope flying away from her. There is also a second preview where Chris Pine's Steve Trevor welcomes Diana Prince to jolly old London, although Diana is clearly not too impressed. There are also a number of brief scenes where Wonder Woman blocks a bullet with her bracelet and other battle scenes as well. 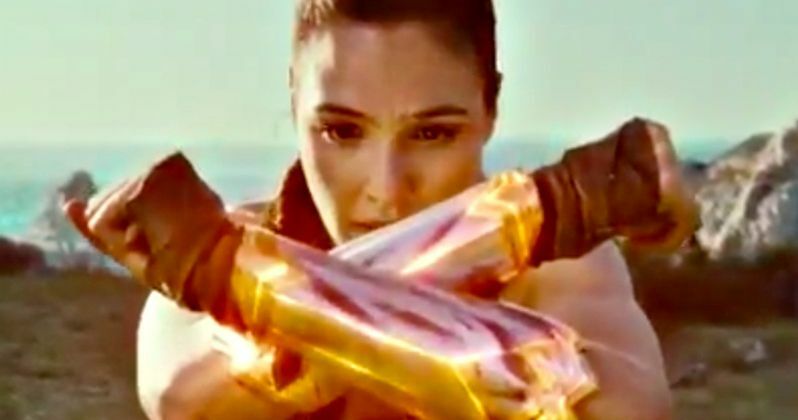 In addition to these trailer previews, Gal Gadot sent out a new video of her own this afternoon, thanking fans for their wonderful response to the poster. She also teases a special surprise that she will have for fans tomorrow, which we already know is the new trailer, which will debut during the Kids' Choice Awards. With less than three months left until Wonder Woman hits theaters, it remains to be seen how much more footage will be shown from this highly-anticipated superhero adventure. Before she was Wonder Woman, she was Diana, princess of the Amazons, trained to be an unconquerable warrior. Raised on a sheltered island paradise, when an American pilot crashes on their shores and tells of a massive conflict raging in the outside world, Diana leaves her home, convinced she can stop the threat. Fighting alongside man in a war to end all wars, Diana will discover her full powers...and her true destiny. The supporting cast includes Chris Pine, Robin Wright, Danny Huston, Ewen Bremner, Saïd Taghmaoui, Elena Anaya, Connie Nielsen and Lucy Davis. Patty Jenkins directs Wonder Woman from a script by Allan Heinberg and Geoff Johns, based on the DC Comics character created by William Moulton Marston. The film is being produced by Charles Roven, Zack Snyder and Deborah Snyder, with Richard Suckle, Stephen Jones, Wesley Coller, Geoff Johns and Rebecca Roven serving as executive producers. Warner Bros. has set a June 2 release date for Wonder Woman, putting it up against 20th Century Fox's animated adventure Captain Underpants. Take a look at these new trailer previews, along with the special message from Gal Gadot, and check back tomorrow for the full Wonder Woman trailer.